Sunday 16 July 2017 marked the 75th anniversary of Vel d’Hiv, the rounding up of the Parisian Jews to the local velodrome and eventual deportation to Auschwitz. Over 13,000 Jews were taken over a two-day period; only a few hundred returned. While being the most famous of the Paris round-ups, it wasn’t the first. That occurred in May 1941. My father witnessed first-hand the events of the third one in August 1941. The first time I heard the story was when my son was 15 (around 2003) and wrote a biography on his grandpère for school. In August 1941, my father lived with his parents (Vitali, 69, and Estelle, 61) in a flat at 77 Rue Sedaine in the 11th arrondissement (district), an area primarily inhabited by Turks. Life for Jews changed dramatically after the German occupation of Paris in June 1940. The publication of the premier Statut des Juifs prevented Jews from doing civil, commercial or industrial work, or from holding public office. At the same time, the law concerning Jewish foreigners was proclaimed and authorised the immediate internment of non-French-national Jews. The Vichy regime under Marshal Pétain wanted to be rid of all such Jews. By late 1940, all Jews had to register at the local police station and wear the Star of David on their clothing. Although born in Constantinople, my grandparents were Sephardi Jews rather than Turks but made the decision not to register, as did my father. 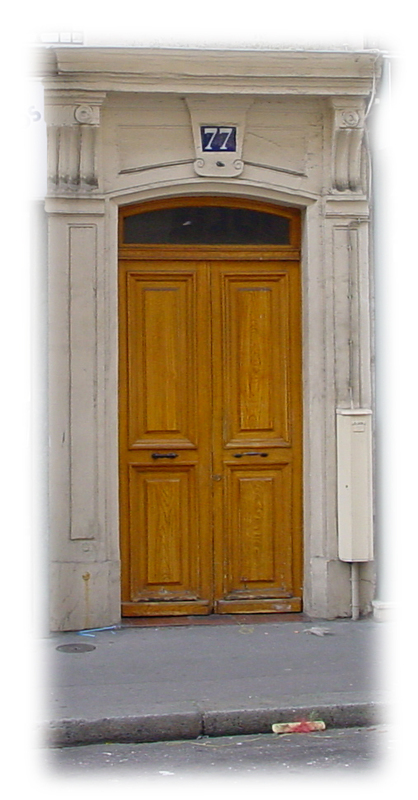 Very early on the morning of 20 August, each end of Rue Sedaine was blocked off and the French police went house-to-house with a list of names from the register, arresting the Jews and taking them first to the police stations and then to the internment camp at Drancy where they remained until transported to Auschwitz to be murdered. Over 4,000 Jews were rounded up in two days. Macron has stated that: “Not a single German took part.” While the German soldiers may not have gone door-to-door, they certainly manned the blocks at either end of the road. My father saw what was happening from his window and made the decision to escape. He told his parents to bolt the door after him and not to open it under any circumstances. Being in their 60s, the chances are that they wouldn’t have been taken away as the round-up concentrated on those aged between 16 and 50 but younger children were certainly taken. For example, in the November 1942 round-up, records show that the Aboav family at the same address (Clara aged 43 and her daughter Jeannette, aged 2) were also deported to Auschwitz. Walking out of the front door, my father saw one of his cousins lying in a gutter and dozens of friends and neighbours being herded to the end of the street. On walking up to the road block, he could see both French gendarmes and German soldiers. He knew that the gendarmes would recognise his accent as being French so he went to one of the Germans and asked what was happening. On being asked whether he was a Jew, he spat on the ground and said: “no, I’m an arab.” With that, they let him leave. He made his way to Lyon in the Free French Zone to the south where, he said, he became the manager in charge of the national distribution of potatoes. From here, he made sure that a sack of potatoes was delivered to his parents in Paris on a weekly basis. Even after being informed on as a Jew and having to escape again, he ensured that the delivery continued until the end of the war. This single act saved his parents’ lives. I was never sure whether this story was true or fabricated until after my father died. 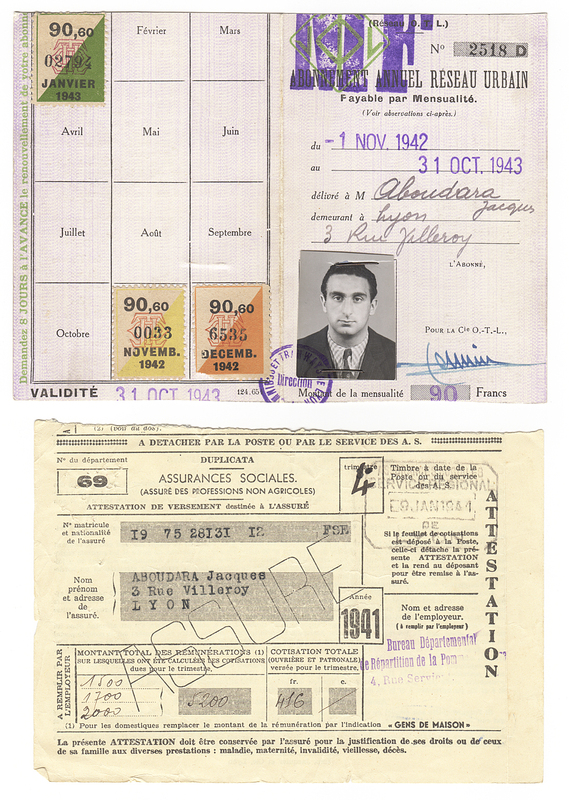 In a locked black briefcase I found all his documents from World War 2 including his National Insurance card for 1941, a season ticket for travel in Lyon and pay slips from the Bureau Départemental de Répartition de la Pomme de Terre (The Department for Distribution of Potatoes) dated from October 1941 to December 1942.